Samford University will host a free public talk featuring Venerable Geshe Lhakdor 3–4:30 p.m. March 29 in Brock Forum, Dwight Beeson Hall. The event is being coordinated by faculty members in the departments of religion and public health and Samford's Center for Science and Religion. The Buddhist scholar has served as translator and religious assistant for His Holiness the Dalai Lama since 1989, and currently is director of the Library of Tibetan Works and Archives in Dharamshala, India. Geshe also is a trustee of the Foundation for Universal Responsibility, director of the Central Archive of His Holiness and is a member of the advisory board of the Institute of Tibetan Classics in Montreal, Canada. He facilitates the Science for Monks program, and shares his own expertise as a scholar of science and philosophy. 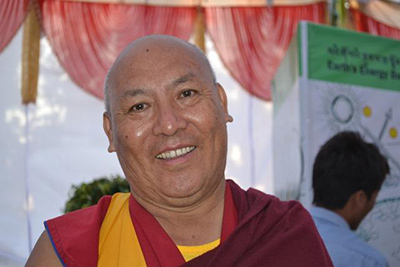 Geshe studied specialized Buddhist philosophy, earning the Master of Prajnaparamita in the Institute of Buddhist Dialectics, and the Master of Madhyamika and Master of Philosophy from the University of Delhi. He holds honorary professorships at the University of British Columbia and the University of Delhi. At Samford, Geshe will speak about science, religion and the meditative life.